Little Boy Blue, come blow your horn; the sheep’s in the meadow, the cow’s in the corn. Here is the original fabric relief illustration for the rhyme, Little Boy Blue, from my book, Pocketful of Posies. The embroidered piece is first mounted on a foam core board for the photographer. Afterward, I stitch a felt border, remount, and frame each piece, making it ready to hang. I tried out some different shades of upholstery fabric for the background and selected this warm brown with a vine pattern. Then I cut the border sections out of wool felt. I used variegated pima cotton to edge the pieces with blanket stitch. Later, I added chain stitched curly cues with variegated embroidery floss. The haystack is padded with wool stuffing and the texture is stitched with tapestry wool, with real pieces of straw sewn in, too. Little Boy Blue’s hat is made from thread wrapped wire and his horn is a cactus thorn. This original illustration was one of 50 pieces of artwork from the book in the touring exhibit, Pocketful of Posies from 2010 to 2015. 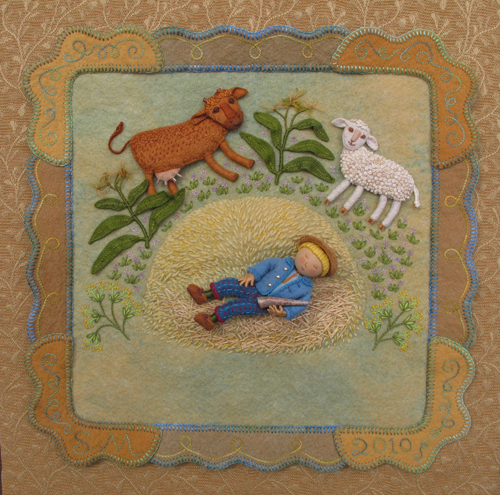 This entry was posted in Animals, Children's Books, Fabric Relief, Felt, illustration, Pocketful of Borders, Posies Traveling Show by Salley Mavor. Bookmark the permalink. My favorite posts from you are the ones where you so generously share your creative processes with all of your fans. Thank you so much, I just gaze at the pictures in awe. Thanks for sharing your methods, it is a special person who dares to tell everyone the techniques they have developed. I love looking at all the details of your work. I have these moments of “oh! that’s how she did it….clever!”. It helps me to think differently when I approach something new while sewing. I received my “Iris” yesterday. Oh my, she’s beautiful. I had no idea your stitches were “that” tiny. Although I admired your work before, I have much greater respect for your talents after seeing the real thing. Thank you! I’ll treasure Iris. You are truly a very talented and patient artist! I loved yesterday’s Iris pictures. Thank you! Oh, how I love to see how you create your artworks! It is so much fun and so very inspiring to me. I just found an old bell with a wooden handle, which I am painting as a snowflake lady. I can hardly wait to get to the fabric part of the project and am sure your inspiration will be in the finished piece. Won’t this be fun as a gift exchange for our painting chapter’s Christmas lunch? Your book has inspired me to make so many interesting dolls! It is delightful to think of my little people living in many parts of the world. Thank you, Salley!!!! I love his blonde hair coming out from that neat hat. And a cactus thorn for a horn? SO uniquely creative! Thanks, Nan. Lots of people ask about the hands. They’re are made of bent wire that is wrapped with thread, the same as hats, baskets, etc. It’s similar to wrapping wee folk bodies, but fussier. Salley, your work delights me! Visiting your blog is one of my favorite things to do. Beautiful work. Thanks for sharing Salley.